Today’s post is the second in a four-part Advent series. To read the first post in the series, click HERE. I open my planner and see all of the “to-dos” on my list, many more than usual. Each task, in and of itself, is a delightful privilege to do for my family. As a mom, I know I am instrumental in making the magic of Christmas come alive in our home. What an honor! The joy on my kids’ faces, the anticipation in their hearts—that is my reward, even if it comes with some long days and busy nights. But I don’t want to arrive at Christmas Day in as an exhausted heap, too tired to celebrate Love coming down to earth. The very essence of this Advent season is to wait in joyful expectation for the Baby who is coming to restore my weary soul. And the longing for peace, for quiet, and for calm is as real as the baking, wrapping, and decorating. But how do I make room for silence and stillness, when there is just so much to do? It is as if all of Heaven is holding its breath for the birth of Christ, and I am so busy with errands and checklists that the bright star above Bethlehem just might disappear before I have a chance to look up. As much as Advent and Christmas are times to make sure my family makes memories and cherishes traditions, Jesus has a very special gift for me, too—an invitation to slow down this Advent. But how, in the midst of the hustle and bustle, am I going to pause long enough to receive it, unwrap it, and savor it? In Scripture, the Lord invites us into silence and stillness. Over and over, the invitation is extended. When we come to Him, wait for Him, be still with Him, He gives us the gift our weary souls need: He gives us Himself. When we break out of the cycle of creating more to-dos than are necessary and exchange some of them for a little quiet stillness and prayer, we make room in the manger of our hearts for the Babe to be born. In the silence and stillness, the Lord comes. This is what Advent is really all about! Traditional carols echo the theme of silence and stillness pitch-perfectly. So how do we practice silence and stillness during the busiest time of the year, in order to truly receive what God wants to give and what we so desperately need? 2). Reflect. Pray along with the daily readings in the Magnificat or on the USCCB website. This can lend structure to your prayer time, and God will use the readings to speak very personally with you. Sit with the words, ponder them, and journal their meaning. 3) Reconsider. Bring your to-do list with you to prayer, and ask the Lord for wisdom as you continue all of the other Christmas preparations. Jesus delights in our desire to make Christmas wow for our families and friends. But is there anything that you could cross off of your list, to make it less hectic? Invite the Lord into your decision. 4) Light. At the end of a long day, make a cup of tea and sit quietly in front of the Christmas tree. With all other lights off, it can be a simple but meaningful way on these dark nights to anticipate the birth of Christ, the Light of the World, basking in the glow of the tree. How do you find silence and stillness in the midst of the hustle and bustle? Please share your thoughts in the comments below. 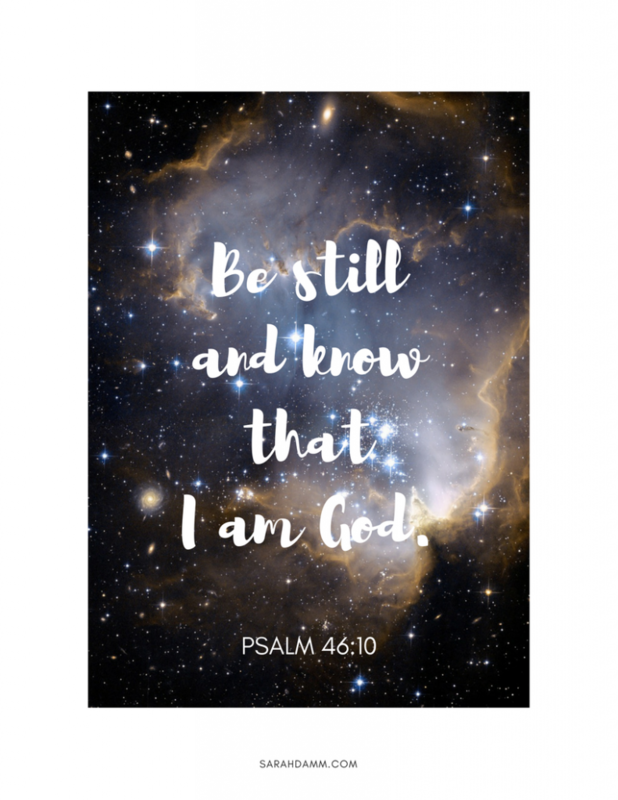 Click HERE for this week’s FREE printable. Place it somewhere as a reminder of God’s love for you, especially when life feels a bit hectic this week. Have you received your FREE Advent prayer journal for all email subscribers? We’re only one week into Advent, so it’s definitely not too late!